The Hilux accounted for more than 30% of the marque’s overall vehicle sales. The Toyota Hilux has been crowned South Africa’s most popular new vehicle for the eighth consecutive time in 2018. 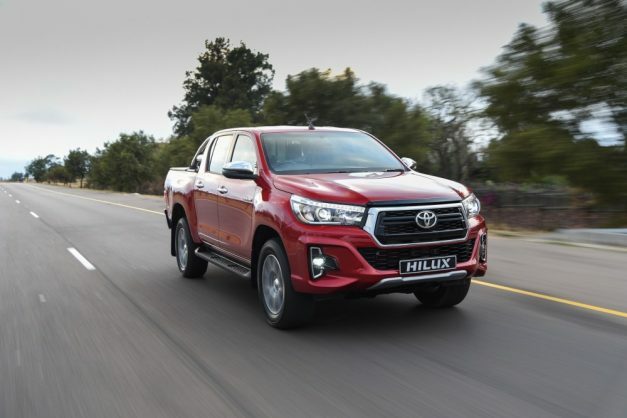 Amassing a total of 3 366 units in the month of August and 26 581 year-to-date, the Hilux is now 6 468 units ahead of its nearest competitor with some four months to go before year-end. The mighty Hilux accounted for more than 30% of the marque’s overall vehicle sales as well as more than half the Toyota Light Commercial Vehicle (LCV) total sales. Key to the total LCV sales of 5 039 was the Quantum platform, recording 1 477 sales – including 1 257 taxis, 172 busses and 48 vans. On the passenger front, Toyota moved no less than 5 434 units – with outstanding sales performances by Corolla and Corolla Quest (1 136), Etios (900), Yaris (884) and Avanza (442). A total of 1 958 Toyota and Lexus SUVs models also found new homes. SA’s most popular SUV, Fortuner, recorded 888 units, while newcomer Rush sold a total of 300 units. The funky C-HR continued its steady run with a respectable 223 units. Luxury SUVs, Land Cruiser 200 and Prado, fared just as well, registering 109 and 108 sales, respectively. Lexus SUVs were registered double digit sales again: NX (20), RX (10) and LX (14). In terms of Medium and Heavy Commercial Vehicles segment, both the Hino 300 and 500 Series improved on their July sales, selling 186 and 131 units apiece. The Hino 300 Series achieved a class leading 26% share of the MCV segment while the Hino 500 Series had another strong performance with a 19.7% of the HCV segment. “Coming off the strongest sales of the year at 12 840 units in July, Toyota sales took a bit of a step back in August. With one less selling day in August compared to July, as well as the stagnating economic climate, we believe that our dealers performed exceptionally in these conditions. Year-to-date, Toyota has sold a total of 87 968 vehicles out of a total of 363 193 models sold locally, giving us a market share of 24.2%. We could not have asked for more from our customers, staff as well as our dealers across Southern Africa,” says Calvyn Hamman, Senior Vice President of Sales and Marketing at Toyota South Africa. According to Naamsa, new vehicle sales at 47 964 units reflected a decline of 1 234 vehicles or a fall of 2.5% compared to the 49 198 vehicles sold in August last year. “The current socio-political discourse in South Africa was not conducive to uplifting business confidence and investment sentiment, both of which were critical to an improvement in South Africa’s economic performance. The recent sharp depreciation of the Rand exchange rate would exert upward pressure on general inflation, as well as on new vehicle prices,” says Naamsa.